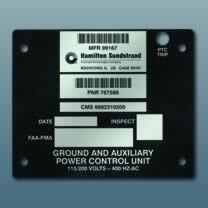 MPC's Metalphoto Rigid Labels and Tags are designed with the ultimate in durability standards to remain readable for the life of your item or part. Metalphoto is the material specified in many applications due to its ability to withstand indoor, outdoor and industrial application with superior resistance to chemicals, abrasion, solvents, extreme temperatures and UV. Metalphoto rigid labels and tags are the preferred solution for asset tracking and product identification labels, property ID tags, instructional labels, safety/warning/caution labels, schematic diagrams, machine data labels, and much more. Why Choose MPC's Metalphoto Rigid Labels & Tags? Provides superior resistance to chemicals, abrasion, solvents, extreme temperatures and UV. Color options are less resistant to UV. Expected exterior life of 20+ years. Silver-colored face stock is high-contrast and easy to read. Highest graphics resolution available on black or silver background. Thicker aluminum for greater impact resistance. High-performance adhesive and/or holes for mechanical attachment. Photosensitive anodized aluminum face stock (optional thicknesses .012", .020", .032", .063", .090", .125"). Permanent pressure-sensitive adhesive and/or holes for mechanical attachment. Many fonts and design elements are available, as well as your company logo. Black graphics on silver background or silver graphics on black background; color options available. Note: Colors other than black possess limited UV resistance. 15 working days from receipt of order and approval of artwork. Expedited shipment is available for an additional charge. No minimum quantity. Get a quote for any size job. Get a quote for any size job - we have no minimum piece requirement. Our minimum production run is $400 per part number, excluding set-up fees/tooling. Contact us regarding your project. Quality delivered on time at a reasonable price. How could you ask for more? Sign up for our newsletter and get new product information, tips, and special deals.